Height: 1602 feet above sea level. Date climbed: First visit: 23rd July 2011 (walk 40). Second visit: 28th July 2017 (walk 133). 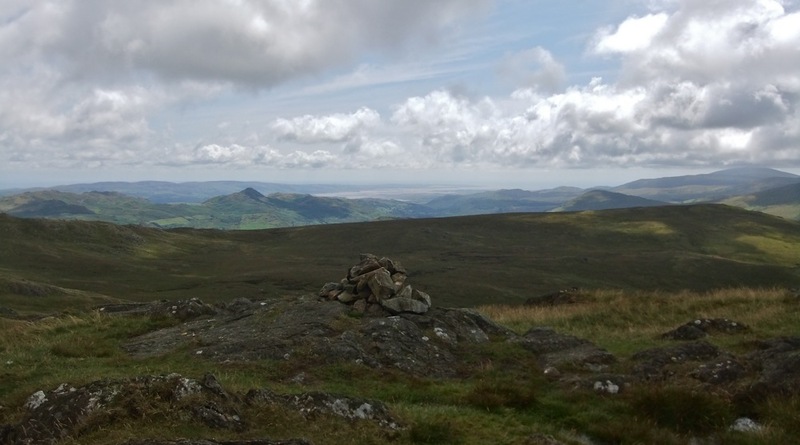 Green Crag summit, looking south to the Duddon estuary. Route of ascent and descent: First visit: Having walked all the way from Ravenglass and along the south shore of Devoke Water – a troublesome trek described in all its boggy detail on the walk 40 page – I basically ascended from the Eskdale-Duddon Valley road at Woodend Bridge, up over Great Worm Crag. Descended to Eskdale, by way of Birker Force. 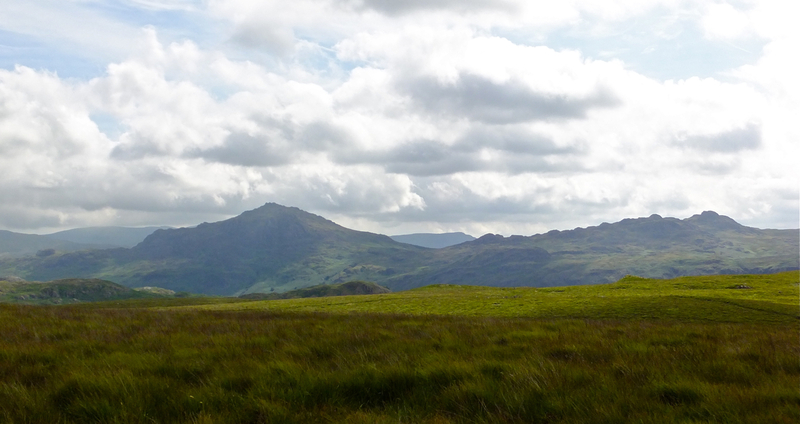 Second visit: Came up from Grassguards, having got there by another long walk from Coniston, over Walna Scar pass. 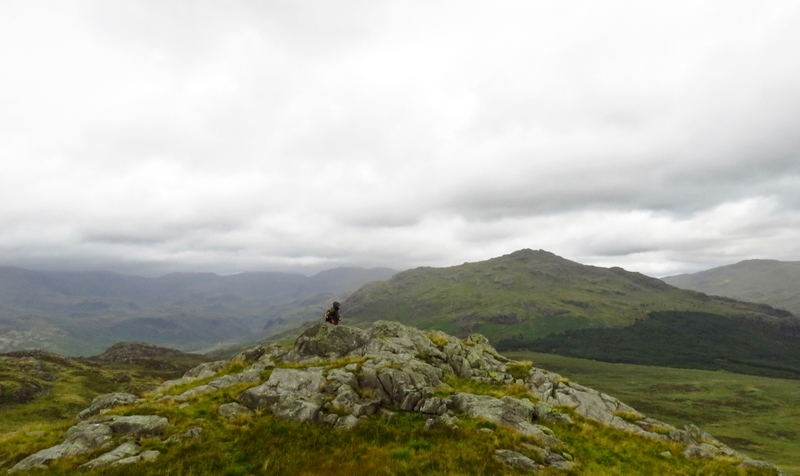 Left along the ridge to Great Worm Crag. Harter Fell and Green Crag (on the right), from Boat How. Picture taken on walk 73. What I say: Wainwright has three goes at depicting Green Crag on page 1 of his chapter but I don’t think any one of them really do justice to what is a striking-looking fell, despite its relatively limited altitude. Were it located somewhere like Grasmere or Keswick I am sure the top would be swarming with visitors and it would be a famous climb. Stuck out where it is, on the very edge of the Wainwright region, it does not get the attention it probably deserves. However, no approach to it is straightforward – even from Eskdale, a journey I did in descent but which I imagine is quite a tough climb when reversed. Paths in the region are inconspicuous and the Crag rises from a sea of boggy ground all around. Having had two very long and unspectacular tramps here, I have to assign it ‘low-reward-to-effort-ratio’ status.